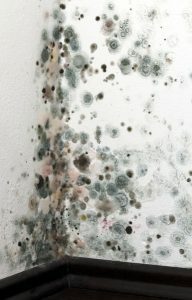 What Is Black Mold and How Harmful Is It? Stachybotrys chartarum is the scientific name for what we call black mold. It’s a microfungus that often grows in cellulose building material that’s become damp. It can often appear in wallpaper, but most parts of modern homes are susceptible to it when exposed to high levels of moisture. It’s rare in nature—it prefers to settle in our living spaces! As black mold grows and eats away at building material, it releases spores into the air. These spores cause a range of respiratory problems in people, and infants are especially susceptible to it. You may notice a high incidence of coughing and wheezing among your household, or other symptoms such as eye and nose irritation, rashes, chronic fatigue, and headaches. Long-term exposure can lead to more serious problems, such as vomiting and bleeding in the lungs. Black mold is often linked to sick-building syndrome. If you see black mold developing inside your house—especially if the house has recently suffered from water damage—you’ll need to contact mold remediation specialists. You can’t just wash black mold off! However, we’re concerned with mold developing in the HVAC system. We recently discussed the installation of UV air purifiers, and these are the most useful tools when it comes to stopping mold and removing mold inside an HVAC system. UV air purifiers are also called UV germicidal lights because they disrupt and kill microorganisms, and that includes microfungus like black mold. The ultraviolet radiation these lights send out kill mold and mold spores while also preventing them from developing in the first place. They don’t use any chemicals and won’t contribute to lowering indoor air quality in some other fashion. Properly installed UV air purifiers are also helpful at mitigating the damage that black mold can cause elsewhere in the house, since any mold spores circulating through the ventilation system will be eliminated by the ultraviolent lamps. We strongly recommend the installation of UV air purifiers for most homes in the area because of the high humidity levels. It’s simply a good precaution so you have the best possible indoor air quality in Lake Butler, FL and the surrounding areas. We offer excellent indoor air quality services and pride ourselves on customer satisfaction and quality work with reasonable prices. We give customers a 100% guarantee on service work. Call Touchstone Heating & Air Inc 24/7 for exceptional customer service!